The erosion control silt fence is a favorite for silt control on job sites, construction sites, and other areas where silt or sediment is being displaced. Great for use as perimeter control, sediment control, or silt containment, our silt fence is placed around sites to help prevent erosion and maintain water flow from your site. Due to varying conditions and sediment requirements, the silt fence comes standard in three different fabric grades: Economy (50 gram), Contractor (70 gram) and DOT (100 gram). 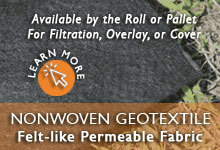 Questions about silt fence detail? We can help! Call our team at 1-772-646-0597 or fill out our quote request form to discuss your requirements. Fabric options for all construction site silt fencing includes either an economy (50 gram), contractor (70 gram), or DOT (100 gram) grade material. For most construction sites dealing with sheet flow, silt fencing is installed by excavating a trench and securing the bottom of the fabric into the trench. Fabric is usually buried about six inches (6") to help withstand water, sediment and increased weight. Posts should be attached to the fencing and then placed into the ground. Spacing for the posts may vary depending on your location, water build up and fabric type. For most locations, post should be placed no more than 8-10 feet apart. For areas with heavy water requirements or heavy duty fabric, stakes should be placed closer together (5-6 ft. spacing). For the most effective silt control, each erosion control silt fence should be placed in two rows that are spaced approximately three feet (3') apart. 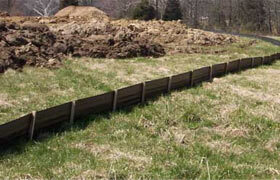 This provides a back up row of fencing for your construction site. All fencing should be inspected regularly after each rainfall even and when there is significant build up on the curtain. 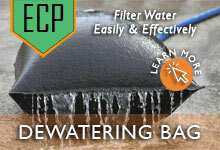 Questions about construction site silt fencing? We can help! Call our team at 1-772-646-0597 or fill out our quote request form to discuss your requirements.